The protesters at the rally in Dundee city centre. An altercation broke out at a Dundee anti-fascism rally after a member of the public shouted a pro-Nazi slogan at protesters. 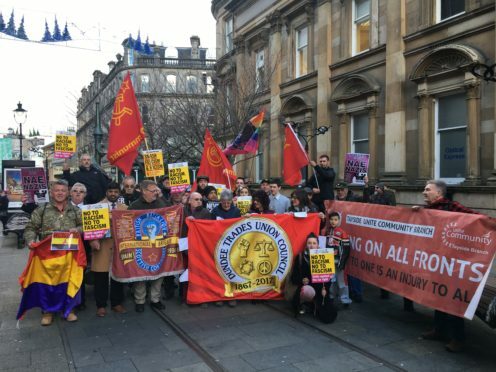 A number of organisations including Dundee Antifa, a group who describe themselves as fighting an “ever present threat of fascism, racism and bigotry”, Stand Up To Racism, the Socialist Workers Party, Unite the Community and United Against Fascism staged a demonstration in Dundee city centre on Saturday. As around 50 protesters posed for a photograph outside the McManus Galleries, a young man walking by shouted Nazi propaganda slogan “ein volk, ein reich, ein fuhrer” while giving a Nazi salute. An expletive-ridden exchange followed, during which the man and protesters squared up to each other on the steps of the museum. A number of protesters chanted “Nazi scum, off our streets” while one person shouted “f**k white people”. Meanwhile, the man at the centre of the argument took exception to flags sporting the hammer-and-sickle communist symbol, which he said insulted “thousands who died in the gulags”. The heated argument stopped short of physical violence and the member of the public eventually left of his own accord. No police were present on the scene. Later that day, protesters took to social media to denounce the person who shouted “f**k white people”, claiming that the rally had been “infiltrated” by individuals seeking to cause trouble and discredit the demonstration, which they said was not anti-white. The same individual, who had his face hidden behind a scarf, had earlier shouted “nae Nazis, nae white people” while marching. Michael Taylor, branch secretary of anti-poverty group Unite the Community, who was present at the march, said: “It’s outrageous that a person was shouting fascist slogans within a few metres of a memorial to the Spanish Civil War. “It’s a reflection of the times that we’re living in, that he felt he could do that. The march was organised in response to reports that neo-Nazis, who posted photographs of themselves posing beside Dundee landmarks, were active in the city. Members of the Scottish Nationalist Society also put up stickers around the city centre and claimed to be recruiting for new members. Jim Barlow of campaign group Stand Up To Racism, who was one of the organisers of the protest, said: “It was an insult for neo-Nazis to photograph themselves beside Dundee landmarks, some of which commemorate freedom and democracy. “They might be daft wee laddies but unfortunately what they are doing is spreading racial hatred and blaming immigrants for our society’s faults.